“Two Trees” covers points about the stories in the bible, its prophecies about the Hebrew Israelites, and its meaning. The author shares the truth about the history of Adam and Eve and their story in the Garden of Eve through the teachings of her father. Experience this memoir from a father to a daughter that shares biblical history, its meaning, and so much more. Dr. Jacquelyn Hester Colleton-Akins grew up hearing stories from her father. From life stories to biblical teachings, she always finds delight in listening to her father’s wisdom and knowledge. She has written books with her father’s stories as one of her inspirations. This time, she imparts her readers a memoir that focuses on the biblical teachings that her father had shared. “Two Trees” brings readers back in the beginning when Yahawah planted the Garden of Eden. It talks about how Adam and Eve failed to obey Yahawah and chose the Tree of Knowledge of Good and Evil over the Tree of Life. 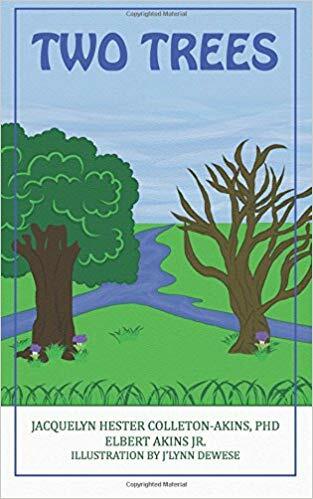 The author recognizes how her father always wanted to share the truth about Adam and Eve and through that, she felt the need to share that with her readers. As “Two Trees” joins the upcoming 2018 Frankfurt International Book Fair, Colleton-Akins hopes to share this memoir to a wider audience. The world’s largest trade fair for books is happening on October 10-14, 2018 so be sure to check it out! Published by: Martina Publishing, Inc.
Jacquelyn Hester Colleton-Akins, a native of Jacksonville, Florida. She is the proud mother and grandmother of four children and six grandchildren. On December 4, 2013, she moved to Walterboro, South Carolina, to enjoy the open country and plant many different kinds of fruits and vegetables. Jacquelyn began her writing skills at the age of three years old at home with the help of her daddy, by using interesting life stories as a fun time every Friday night for a family gathering, to hear her daddy tell stories about the past, present, and future. Jacquelyn began her journey towards being educated in several colleges and universities. She always kept in her mind these principles, reading the Holy Bible every day, learning the Ten Commandments, and keeping God’s statutes to live by daily. Today, she is honored to be a publisher of three books with a five-star rating. The first book is called: “E-Babe the Outer Space Detective,” the second book is called: “Prediction Stories” and the third book is called: “My Experience.” She will continue empowering the public with other books and novels pertaining to life’s journey for all age levels.